Ultimately, the conversation ended on a low note because she ended up giving me the equivalent of the “it’s all in your head” speech by suggesting that possibly this fatigue is actually depression. Now, I’ve been depressed before, y’all, and this is nothing like that. I do understand that fatigue is a symptom of depression, but unlike the times when I have been depressed, I actually WANT to do stuff. I WANT to write, to exercise, to knit, to be awake and to live. My mood is fine. But my body is another story. Most days I feel as though I am encased in cement. My eyes are gritty in the middle of the day. And, no matter how much or how little sleep I get at night and what time I wake up in the morning, I usually need a nap by 2 pm. I seriously do not believe in my heart of hearts that this is depression. I don’t feel depressed. Could I be wrong? Sure. But I really want to explore the idea that it could be something else. Which is why, in fact, I went to see the sleep doctor and have the sleep study done. Today was the follow-up appointment with him. The good news: I do not have OSA (Obstructive Sleep Apnea)! Which means that I am not going to die suddenly in my sleep which is a VGT (Very Good Thing). The bad news: I still do not have a reason for constantly being fatigued! One thing my sleep doctor did say, which I found quite irritating, was that during the 3 hours of actual sleep I got, I had 27 instances (9/hour) of partial airway collapse, and, according to him, 10/hour would have meant a diagnosis of mild Obstructive Sleep Apnea (although they still don’t give a CPAP for that). Argh. Perhaps if I had been able to get a better night’s sleep they’d have a better picture of what’s going on with me? I dunno, but it still pissed me off. I haven’t forgotten you. I hope to come back tomorrow with a post, but we shall see. 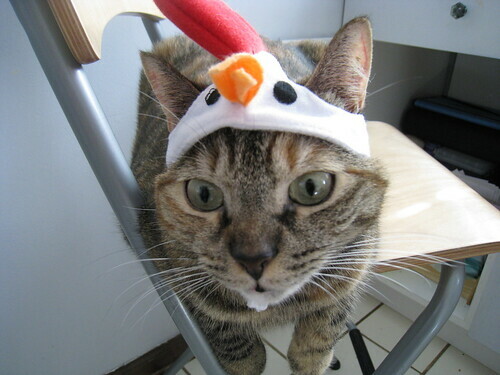 In the mean time, here is a picture of Lolly in a chicken hat. and then I attempted to sleep. I say attempted because I really did have a hard time sleeping. 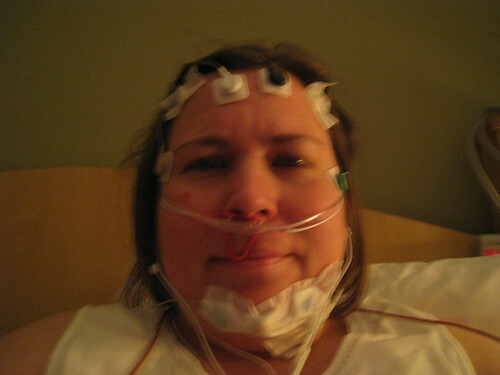 Not only is it really difficult to fall asleep when you are aware of something on your face and under your nose, but I was also kind of excited about the sleep study, so every time I felt myself starting to drift off, I would wake myself up thinking “OMG I’m falling asleep! SQUEE!” Then at some point my minder asked me to sleep on my back for a while, but because I am paranoid about sleep apnea I have kind of trained myself not to sleep on my back and so I didn’t really sleep for that part of the study. Also, there was one sensor on my scalp which kept coming off and had to be reapplied a couple of times during the night. So yeah, it was a pretty rough night, although my minder told me I did get some sleep even though I felt like I didn’t get any. And I didn’t get to try a CPAP during sleep either, which was kind of disappointing because it means I will likely have to have another study done. Verdict: Sleep studies are not as fun as they sound. Knitting · life · Meh. OMG you guys, I am insanely excited for tonight. I’m scheduled for a sleep study at the hospital where I’m to be evaluated for sleep apnea, the likely cause of this fatigue I’ve been struggling with. I’ll be hooked up to all manner of sensors and they will watch me sleep to see how it goes. Ooh, I can’t wait. I love that sciencey stuff. Also, my sleep doctor is incredibly nice, too, so that’s a bonus. I love that colorway. So much fun and very cheerful. 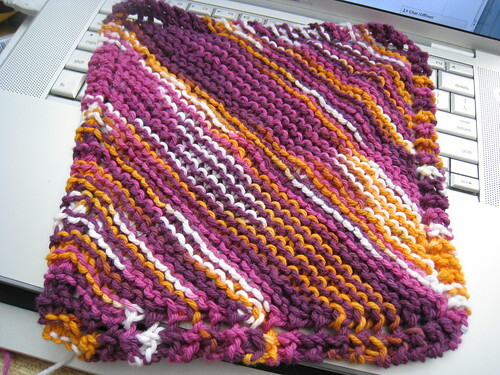 To top it off, I’m nearly done with my secret weaving project. Now, I’m off to make dinner before heading over to the sleep lab. Cheers!